I spent the morning at the Carpenter Complex watching the workouts of the Phillies minor league system. One player who caught my attention was catcher Logan O’Hoppe. No matter he just turned 19-years-old and was a 23rd round draft pick last June. This guy just looks like he is a top prospect. O’Hoppe is listed at 6’2″ 185 lbs. from Long Island New York. He looks like a Buster Posey type to me. That would work. Remember the Phillies have control of J.T. Realmuto for only the next two seasons. An organization can never have enough catching. In today’s workout O’Hoppe was matched up in a hitting group with Mitchell Edwards from Australia and Bruce Wang from mainland China.Hard to believe but these three guys might be the best young catchers in three different continents, North America, Australia and Asia. Watch video from today of each of them taking batting practice. O’Hoppe HERE, Edwards, HERE and Wang HERE. I do not know if the three will wind up on the same team this season though they were kept together in workouts today. They would seem to fit in the New York-Penn League with Williamsport. 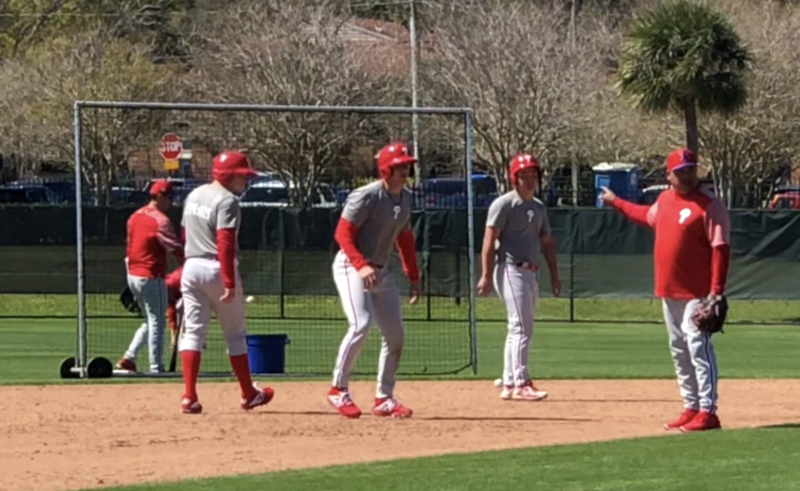 This entry was posted in 2019, March and tagged Bruce Wang, Logan O'Hoppe, Mitch Edwards, Philadelphia Phillies, Phillies young catchers. Bookmark the permalink. Great video from Betsy on the three catchers in the cage. What i found interesting….mitchell Edwards batting stance left handed vs right handed. It is different from one side to the other. Left reminds me a little of Anthony Rizzo…bat held vertical to the body in line with bis left shoulder, before his load, and then a quick explosive swing…..right side looks the typical right stance with bat barrel angling slightly behind the right shoulder.